What are intelligence, creativity, and talent? How can we measure them? Are they innate, or learned? And how can we each uncover our own? 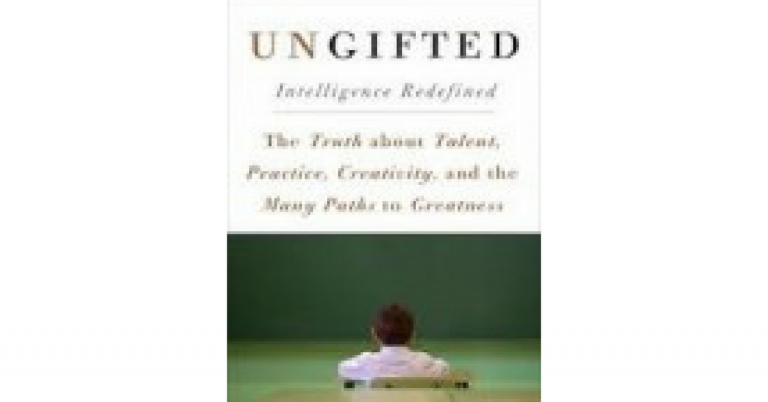 Scott Barry Kaufman tackles all of these important questions and many more in Ungifted: Intelligence Redefined. I found the book compelling, well-researched, and powerful, especially because Kaufman speaks both from his professional expertise as a cognitive psychologist and his own life experience. Growing up, he went from ‘special’ classes to becoming a NYU professor and author. Even before the first chapter, Kaufman makes a paradigm-shifting point when he writes that intelligence is not zero sum game. IQ – society’s current standard for measuring intelligence – then is only one part of a rich and dynamic picture in which heritable traits, behavior, mindset, opportunity, perseverance, and motivation all play together. Through much of the first 6 chapters, I kept thinking of Carol Dweck’s work on the “growth mindset” and Kaufman turns his attention here in chapter 7. He sheds light on what others including Dweck and Heidi Grant Halvorson have found in their research: When we set goals focused on improving we are more resilient to setbacks than when we have goals focused on demonstrating ability. When we are focused on learning and the journey, we tend to stay more engaged. We pay more attention to feedback, learn more from it, and perform better in the long run. Set a goal for yourself to learn something new and/or become better at a skill. Focus on and enjoy your progress, and don’t get attached to the idea of completely mastering the skill. If you manage a team make it a point to praise effort at least as much as accomplishments to foster a growth mindset. On the flipside, social comparison and status threats almost always negatively impact confidence, brain function, and performance. So, how can we regulate these negative factors to perform better? One study Kaufman shares found participants who wrote about their emotions about an upcoming challenge performed better on the task. It may be that the writing helped them reinterpret their negative emotions and prepare for action. Write down how you feel about your next upcoming challenge. How does that change your perspective on those emotions? Abundant research suggests that, as I’ve written about previously, meditation is one great way to boost self-control. There are many ways to meditate, and even a few minutes each day can be effective. Kaufman also suggests that people who are the most creative love their work. They have a sense of mission. They think deeply, tolerate mistakes, and are comfortable holding minority opinions. They have a passion that drives persistence. As you can imagine, this resonated strongly with me. Create your own action plan for becoming happier at work. Define how your work supports a bigger mission that is aligned with your own values and goals. If you are a manager, have this conversation with your team members. I recommend the book as a place to start for anyone who wants to work smarter, be more creative, and achieve more. If you are a bit of a geek like me, you’ll enjoy it more – it’s fairly academic and often describes studies in detail, perhaps too much for some. Overall it is an excellent and fascinating book. If anyone would like a book summary I wrote that’s somewhat longer than this post, please contact us to receive it. I’d love to hear what you think and how you apply these insights. ← How to program your organization for talent retention.